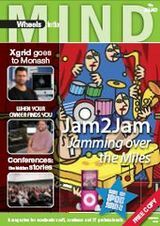 Recently, jam2jam appeared as the feature article in the Autumn 2009 issue of the Apple University Consortium's Wheels for the Mind magazine. "It started out as an experiment in music-making for children, but Andrew Brown and Steve Dillon's Jam2Jam has rapidly grown into a worldwide phenomenon that has featured in interactive museum applications and will this year facilitate musical jams between students around the world." In early March, Queensland University of Technology announced 15 new fellowships under the Vice-Chancellor's Research Fellowship program, including former ACID student Dr Marcus Foth. Vice-Chancellor Professor Peter Coaldrake introduced the fellowships last year to help 10 researchers and has expanded the program for 2009 due to the high calibre of the applicants. The program funds three-year, fulltime research fellowships, with the funding amount varying depending on the project. It aims to build on QUT's research strengths, with a particular focus on early career academics and creating research leaders of the future. Marcus is a Seninor Research Fellow at QUT's Institute for Creative Industries and Innovation. He received a BCompSc(Hon) from Furtwangen University, a BMultimedia from Griffith University> and an MA and PhD in digital media and urban sociology from QUT. He was a 2007 Visiting Fellow at the Oxford Internet Institute. Employing participatory design and action research, he is working on cross-disciplinary research and development at the intersection of people, place and technology with a focus on urban informatics, locative media and mobile applications. Marcus has published over sixty articles in journals, edited books, and conference proceedings in the last five years. He is the editor of the Handbook of Research on Urban Informatics. He is the conference chair of OZCHI 2009, a member of the Australian Computer Society and the Executive Committee of the Association of Internet Researchers. It's hard to believe it's been 12 months since our last Education Day but it's here again on Friday 13th March (Bwahahaha...). ACID's Education Day is an opportunity for new and continuing ACID postgraduate students to get together, learn about ACID's education program, and connect with their peers and ACID researchers. This year's program includes a presentation by former ACID student, Mia Thornton, on Changing Places: Reflections on early career research in the digital humanities. UX Australia 2009 is a 3-day user experience design conference, with inspiring and practical presentations, covering a range of topics about how to design great experiences for people. It will be held on 25-27 August 2009, in Canberra (Australia). The venue is Hotel Realm, a new 5 star hotel in Barton. UX Australia 2009 is a community conference, with presentations proposed from our community and reviewed by our community. Calling anybody who's ever used a computer: set your creativity loose on the world of music, literature, art and video that is free to play with, remix and manipulate. "Pooling Ideas" is an exciting competition being run by Creative Commons Australia, ABC Pool and the ARC Centre of Excellence for Creative Industries and Innovation as part of the Ideas Festival (a major initiative of the Queensland Government). It aims to get the digital artist in all of us up and running by inviting people to create their own remix works based around the theme "we are what we share". From 2-23 March, mash up a film, tweak an artwork, remix a poem - whatever takes your fancy - then upload it to Pool. The winner gets an internship with ABC Radio National to co-produce an episode of The Night Air, while runners up get Creative Commons packs including USBs chock full of remixable material. Select works will be showcased at the Ideas Festival and pulled apart by our panel of experts at the 'We Are what We Share' seminar (Saturday 28th, 5-6:30pm, State Library of Queensland). So get involved and let us see what you can do with CC material. This time I am excited to introduce you to Dropbox. Most conventionally it's a way to share files, either with yourself in different locations or with others. A folder on your computer is synchronised with a folder on the web, you can log in anywhere and access those files or share links with others enabling them to download files from your Dropbox without seeing any of your other stuff! If you want to get really clever, though, you can do all sorts of things with Dropbox, from synchronising save files for games to using it as a web publishing solution. Best of all, it's free! Head over to the Dropbox for more details. I'm going back into stasis now but if you have any questions, comments or suggestions send them to me at techsupport@acid.net.au and I'll read them when I wake up!